Summary : A surprisingly strong peppery flavored herbal tea. Unfortunately, the strong pepper flavor overwhelms all the other flavors in the tea. And the flavor of ginger is mysteriously absent. Review : Following a heavy meal that led to an upset stomach, I headed over to my ever-expanding tea collection to see if I could find relief. The first tea that showed promise was the Ginger herbal tea from Yogi Teas. And indeed, right on the box the tea promised to improve digestion. So with happy thoughts in my mind I opened the box and gave the tea a try. Yogi Tea's Ginger herbal tea contains the following ingredients : Organic ginger root, organic lemon grass, organic licorice root, organic peppermint leaf, and organic black pepper. Here is how Yogi Teas describes the tea: "Savor the Tradition of Ginger Tea For millennia, herbalists throughout the world have known of the rejuvenating, soothing and invigorating qualities of Ginger. Naturally warming, Ginger has a long history of use for supporting healthy digestion. Ayurvedic practitioners have used Ginger as a way of activating the body’s internal energy which in turn can help promote balance and harmony. In our organic Ginger tea, we build on this tradition by adding a unique blend of herbs and spices to complement Ginger’s piquant flavor. 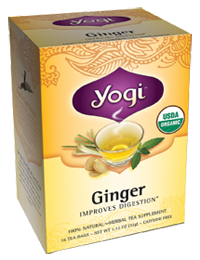 Yogi’s Ginger tea offers a delicious and intriguing blend enjoyable any time of day." The fragrance of the tea right out of the foil wrapper is strong. The aroma definitely says "spicy," as the fragrance of pepper is very distinct. Additonally, there was a mildly strong fragrance of ginger - which combined quite nicely with the pepper to produce a pleasant aroma. So how did the tea taste? 'Unexpected' would be the best word to describe it. Going by what the box said and the aroma of the tea before brewing, I was expecting a mild to moderately strong flavored ginger tasting tea with a bit of a kick due to the pepper and other spices. Instead, I discovered a very peppery flavored tea. Indeed, as I drank more of the tea, the flavor of the pepper seemingly became stronger and completely overwhelmed all the other teas flavors. And by the time I took my last sip I couldn't taste anything except pepper. In short, this tea just seems to have to much pepper in it. In a way, drinking this tea is like "drinking pepper." While that might be fine and dandy for a tea that is marketed as a "pepper or spicy tea," all the pepper in this tea just seems "off" for a tea that is marketed to "aid digestion." Overall, the Ginger tea from Yogi Teas was a disappointment. I suspect this disappointment stems from the fact that I was expecting "a ginger tea" and what I got was an exceptionally strong "pepper tea." Thus, anyone buying this tea needs to keep that in mind - the flavor of the tea in no way matches what is advertised on the box. Recommendation : It depends. If you're searching for a ginger flavored tea, keep searching as this tea isn't for you. However, if you want a spicy tea with a very, very strong pepper flavor, then I guarantee you'll love this tea. One thing is for sure, though, this tea is far from being an ideal after-dinner drink to aid in digestion! Brewing Instructions : Pour 1 cup (8 ounces) boiling water over tea bag and let brew for 5-10 minutes. Eight minutes used for this review. Yogi suggests using 2 tea bags for a stronger tea, although this tea is plenty strong with just one tag in my opinion (perhaps even too strong). Lipton Ginger Twist Herbal Tea : A light tasting, yet pleasant tea from Lipton. Stash Wild Raspberry Herbal Tea : A strong and colorful tea with a very distinctive raspberry taste. Tazo Calm Herbal Tea : A great tasting chamomile tea that mixes spearmint and peppermint. A perfect "bedtime tea."